The Jr25 is the first truly portable high performance Profilometer of its kind. With an optional battery pack and carrying case, the Jr25 provides measurement capability during field studies. 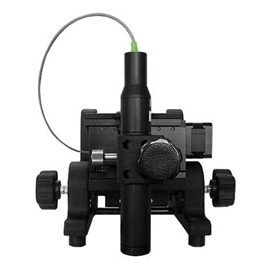 The Jr25 is designed to utilize the superior Chromatic Confocal technique with complete portability. With a total weight less than 5.5 Kg, the operator can safely place the Jr25 onto the surface under inspection. The Jr25 has the ability to measure an area up to 25mm x 25mm and focusing on the surface is easy with an adjustment range of 30mm. With a fully rotational scanning head, the Jr25 has the ability to measure surfaces at difficult angles. Along with quick and ease of use, the Jr25 has been designed specifically for production environments where samples cannot be moved or in open field studies. The scanning head of the Jr25 can also be integrated onto automated robotic arms and other equipments.